The first assortment of Toy Biz’s long-running X-Men line is a veritable who’s who of heavy hitters from the franchise. It’s before they’d committed to going deep into the mythos the way later assortments the way they did later. Included amongst those figures was fan-favorite Nightcrawler. Interestingly enough, Nightcrawler wasn’t actually with the team at that point, having moved onto Excalibur in the mean time. Nevertheless, they were going for more of greatest hits thing, so in the line he went. Nightcrawler was, as noted in the intro, part of the first series of X-Men figures. He was also re-released a bit later, during the “repaints” portion of Series 3, but unlike others in that sub-set, he was essentially unchanged. The figure stands 4 1/2 inches tall and he has 9 points of articulation. Fun fact: when the prototypes for this series were first developed, the original plan was for all figures in the assortment except Nightcrawler to have the basic 5 POA. That changed (mostly anyway), but it’s nice that they always planned to give Nightcrawler actual articulation. His sculpt is the strongest of the Series 1 figures (rivaled only by Magneto for that title), and has aged far better than others. He’s not as limited in movement as Storm, nor is he as rudimentary in design as Cyclops. He’s actually just a pretty darn faithful recreation of the character’s ’80s design. The only slight marring of the sculpt are the two suction cups mounted on his left hand and right thigh. They’re super obvious, rather goofy looking, and not particularly effective. I actually ended up prying them off of one of my two Nightcrawler figures, which improves his look a bit, though he’s still got the visible pegs. Why they added these things kind of baffles me, since it mars an otherwise quite strong sculpt. Nightcrawler’s paintwork is decent enough, being mostly pretty basic work. It matches the others in the assortment, and his comics appearances as well. 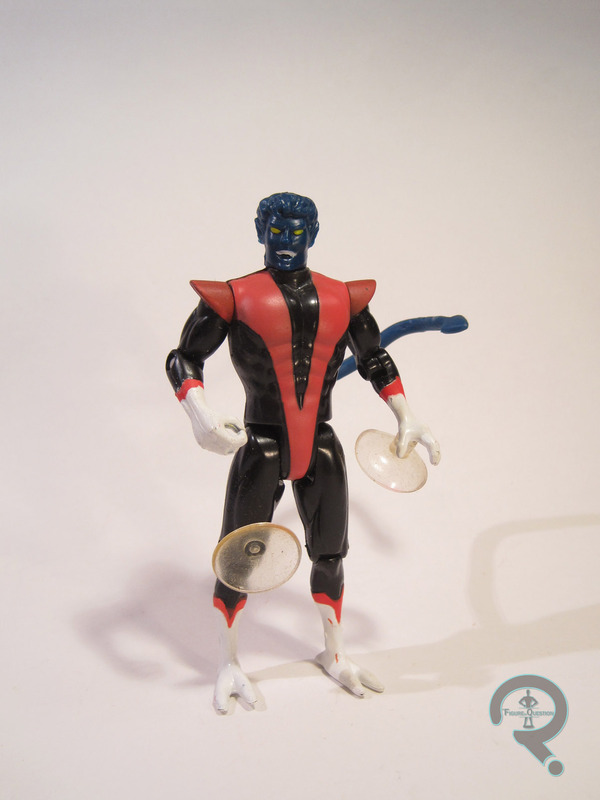 Nightcrawler was originally packed with a cutlass, which both of my figures are, sadly, missing. I got my first Nightcrawler from a flea market near my house. He was my go-to version of the character for a long time. And then I packed up a bunch of my figures like some stupid baby, and this guy got put in the box that ended up buried in the back of the garage, so he was missing for about 5 years. In the mean time, I had tracked down a replacement. Now I have both, and I couldn’t be happier, because, as I noted, he was my go-to. I think he’s still my favorite Toy Biz version of the character.